The Renata 57" Stainless Steel Shower Panel System comes standard with a rainfall showerhead and flexible hand shower featuring a contemporary Euro design in high-quality stainless steel. 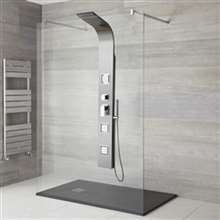 This shower panel provides targeted massage jets and is showcased in a matte finish stainless steel. The panel flows seamlessly to the section housing the control knobs and hydro-jet nozzles. The result is a clean, sleek design. This is probably the most affordable shower panel I have come across having its specs. The shower panel works flawlessly and the water pressure is great too. Seems to be of very high quality. I only wish it just had a wider shower head. But all in all, it is a lovely shower panel. One of my major fears in purchasing products like shower panels is that they will not last in terms of quality over time. However though, since i got this shower panel installed, i have good cause to believe this is one of those highly durable, made to last panels. Still works great and shower still functions like advertised. Great buy. This is one of the most affordable shower panels here that I saw, so I guess that's one reason why I went for this one. Anyway, it actually looks nice for what it's selling for. The features are also okay, and nothing seems to be wrong with it. I think that price is a steal, too. Glad I came across this during the sale. The one thing that persuaded me to get this shower panel is the price. It was selling for less than $500 and the original price was almost a thousand. 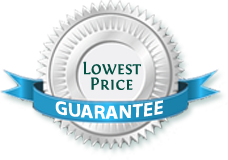 I think it's a good deal, and the price is reasonable enough for what you get. However, I wouldn't recommend this if it isn't on sale. I think there are better choices out there for one thousand dollars.